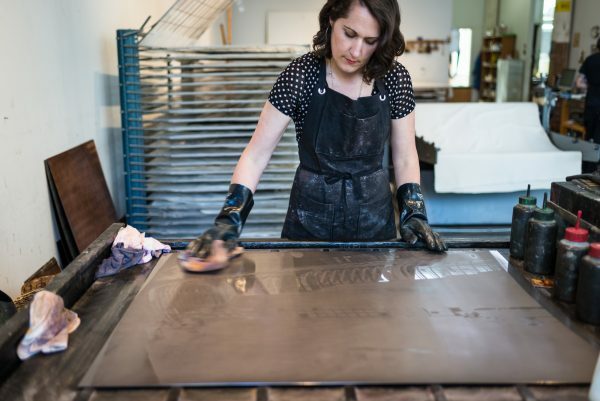 Crown Point Press uses a downdraft table for cleaning plates in the studio. It is a ventilated table that works by pulling air across its surface, then down into a well that is emptied by an exhaust fan installed on the building’s roof. The table is made of wood and can be any size that fits your needs. Consult an electrician about an exhaust fan (with a spark-proof motor) that has the correct capacity for your table size (our fan is 115 volts, 8.7 AMPS, 60 cycles, ½ horsepower). The table frame should stand at waist height. In its base is a well (ours is made of wood) with a metal exhaust tube at its bottom. The tube, or the entire well (as in the photo), is covered with a wire grating. The grating captures solvent-laden rags for drying and later disposal, and keeps miscellaneous items from being pulled into the vent. The exhaust tube leads to a channel vented to the roof where a spark-proof exhaust fan is installed. Inside the well, rising higher than the grating, there is support for a removable work surface. The support shows in the diagram as four pegs set free-standing into the well. It could also be unattached wood pieces (as shown in the photo) that lie across the corners of the low interior frame described in the next paragraph. Air must circulate around these supports. An interior frame is fastened low inside the table frame, above the grating. The interior frame, which is attached to the exterior frame with glue and screws, incorporates a narrow flange-like trough running all the way around the frame’s inner edges. This trough catches drips. It is lower than the work surface and projects into the air space that surrounds it. The work surface is removable and seems to float inside the well. It is supported as shown in the diagram of the table frame. Finally, there is a **lip** that fits over the edges of three sides of the table frame (it is open at the front). The lip is like a cut-out cover on a box. It keeps plates and the unattached work surface from sliding off the frame.